VSA is very excited to continue with one of our very favorite programs for our players this Summer! The Futsal Club Summer Academy program will provide our travel players a unique environment in which they can express their creativity on the Futsal Court but also learn from coaches about the different techniques and tactics of Futsal. At VSA, we are always looking toward fun and innovative ways to continue to grow our players love for the game and we believe our players will not only enjoy this program but also compete in a very competitive environment. 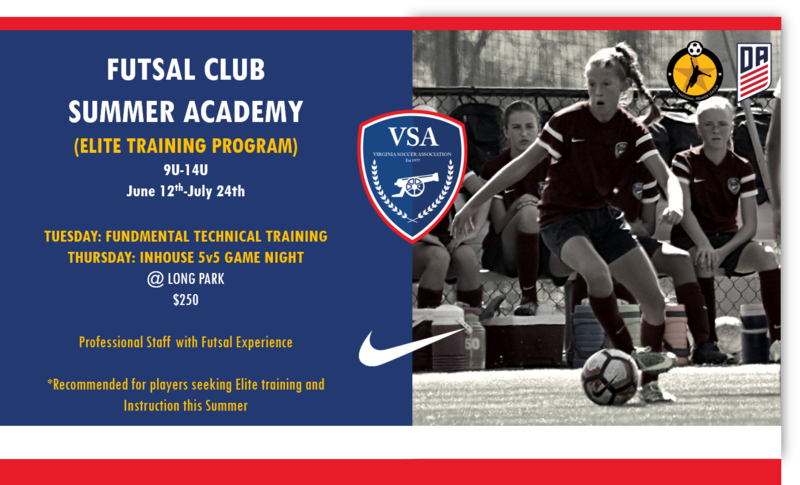 Through our Futsal Club Summer Academy, VSA has aimed to integrate our successful Winter Futsal program into our old Summer Academy Model. Each week the players will be introduced to a new topic in training and asked to learn and become familiar with different techniques and concepts of the game of Futsal. The second training session will serve as a skill development and game related training session in which players will be broken up into separate teams to play. •all age groups are based on the 2016-2017 soccer calendar.